The American Clinical Laboratory Association (ACLA) has sued the U.S. Department of Health and Human Services (HHS), seeking to overturn the agency’s proposed 2018 Medicare payment rates for clinical diagnostic laboratory tests, calculated under the Protecting Access to Medicare Act (PAMA). In its 33-page complaint, filed Monday in U.S. District Court for the District of Columbia, the ACLA contended that HHS instituted a “highly flawed” data reporting process that failed to comply with PAMA’s requirement that Congress implement a market-based laboratory payment system. “Instead of reforming Medicare reimbursement rates to more closely reflect the market, the Secretary’s final rule will disrupt the market and prevent beneficiaries from having access to the essential laboratory services they need,” the ACLA stated in its lawsuit. “This unlawful failure to implement Congress’s commands may benefit the Secretary’s short-term interests in reducing Medicare costs and making the data-collection process easier for the Secretary, but the consequences are severe and disastrous for everyone else. The proposed rates have angered labs that process the tests and others. ACLA previously called for a delay in implementing the 2018 rates until CMS and stakeholders can move closer to a market-based payment solution. “We have repeatedly advised CMS that there are significant, substantive deficiencies in the final rule, which fails to follow the specific commands of the PAMA statute,” ACLA President Julie Khani said Monday in a statement. CMS does not comment on pending or active litigation, a spokesperson for the agency told Clinical OMICs. 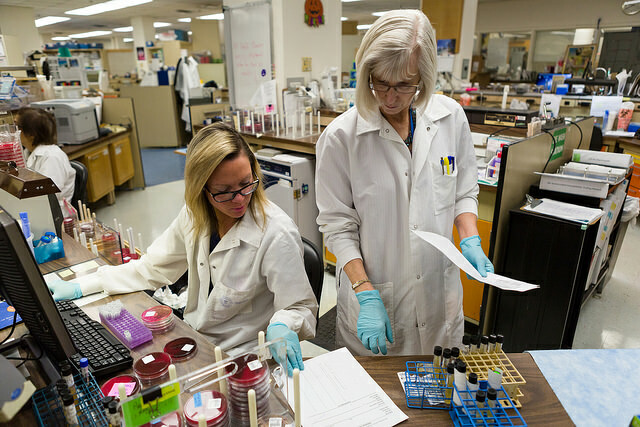 Earlier this year, CMS said the proposed rates would save about $670 million in Part B program payments for clinical lab fee schedule (CLFS) tests in Fiscal Year 2018, roughly a 10% reduction from the approximately $7 billion paid each year by the agency. CMS had projected a $390 million savings in FY2018, rising to $3.93 billion over 10 years. Under CMS’ proposed rates, approximately 75% of tests, would see rate reductions from 2017—with 58% of those having the decreases phased in because the agency has set a 10% per-year cap on reductions from 2018 to 2020. The proposed rates would take effect January 1, 2018. According to the ACLA’s complaint, there are more than 261,500 unique entities that received Medicare payment for laboratory services in 2015—yet only 1,942 laboratories reported information in 2016—approximately 0.7% of the total number of laboratories that currently serve Medicare beneficiaries. And while approximately 7,000 hospital laboratories billed Medicare for laboratory services in 2015—24% of the Medicare payments made under the CLFS—”no more than 21 hospital laboratories (and probably even fewer) reported information to the Secretary, leaving hospital laboratories effectively unrepresented in the data collected by the Secretary,” the ACLA contended. Some 80% of the volume of tests used to calculate the rates was collected only from the nation’s two largest, independent laboratories, Quest Diagnostics and LabCorp. ACLA and other advocates for laboratories have argued that CMS’ preliminary rates would negatively impact smaller labs—especially those that serve rural communities, lower-income communities, and senior citizens, such as nursing-home labs. The ACLS named as defendant Eric D. Hargan in his capacity as acting HHS Secretary. Last month, President Donald Trump nominated Alex M. Azar II, a former president of Eli Lilly's U.S. entity Lilly USA, to the position—which has been vacant since Tom Price, M.D., resigned September 29, following public criticism over his use of government funding for chartered private jets and military flights. Azar’s nomination requires U.S. Senate confirmation. The court case is Civic Action No. 1:17-cv-2645.